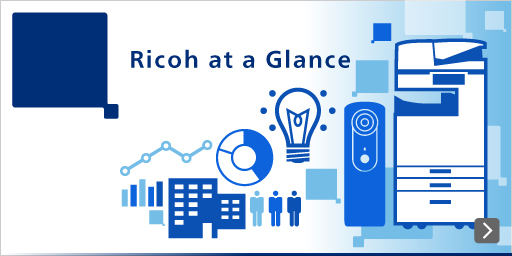 Throughout the first decade of the new millennium, Ricoh promoted the development of work environments that prioritize the health and safety of employees. From 2011 onwards, efforts have been made under the slogan of “One Ricoh“ to realize the lateral deployment of healthy and safe work environments among our affiliated companies in Japan (hereafter, “Ricoh Group in Japan“) where the realization of such workplaces had not yet been adequately promoted. These efforts are being headed by a special department that was established to build the industrial health system and manage safety and employee health for the entire Ricoh Group. In order to make thorough efforts to manage the mental and physical health of its employees, Ricoh, starting from 2006, has been strengthening its capacity for early discovery and treatment of health issues as well as for taking preventative measures to promote employee well-being by providing full-time industrial physicians and nurses as well as promoting the development of an IT system that is linked with work and overtime management. At around the same time, we were also among the first to implement the stress check, which was only legislated last year. Starting in fiscal 2012, we made the switch to a new health checkup (known at Ricoh as a comprehensive health checkup) that supplements legally mandated diagnostic programs with investigations targeting lifestyle-related illnesses and early detection of cancer for all employees over the age of 35. At the same time, we have also been promoting the development of a management cycle that involves the collaboration of staff who work on mental health, physical health, and labor issues. As a result, we are seeing an annual decline in the number of employees who have issues with their physical or mental health. From fiscal 2012, we have been expanding these activities to Ricoh Group companies in Japan. For companies such as those engaged in sales and services that have few employees dispersed across multiple sites, we made industrial physicians and health nurses available by developing an industrial healthcare system in which employees are cared for by area, rather than by company, to enable all employees nationwide to receive coverage in an efficient manner. In fiscal 2015, the Ricoh San-ai Group Health Insurance Union received a divisional award for cancer screening under the Ministry of Health, Labour and Welfare′s partnership award given to companies promoting efforts to prevent cancer. The award was given in recognition of the fact that we not only offer extensive cancer screening tests, but also share the test results with the health insurance union and the company′s industrial physician and nurses. The results are then utilized to provide healthcare advice, etc. Since early 2000, Ricoh has been striving to develop a culture of safety, particularly at its production sites, through activities aimed at acquiring safety accreditation from external organizations. From fiscal 2011, we developed our own accreditation framework appropriate for our internal conditions. From fiscal 2013, this framework has been deployed to affiliated production companies within Japan, with safety activities being conducted in a manner that is suited to the current situation of each company. For example, in working with affiliated companies in the field of logistics, sales/services, and administration where awareness toward safety was not yet fully adequate, we first developed a foundation for safety by implementing the “5S“ activity. Meanwhile, for affiliated companies engaged in research/development, we conducted risk assessments to identify and improve hazardous sites and strengthened training efforts on safety. Since fiscal 2013, the scope of such activities is expanding to include all companies in the Ricoh Group within Japan. As such, information on work-related accidents that occur within the Group is instantly shared among the different companies through a database so that everyone has a common awareness of the cause of such accidents and promptly takes steps to prevent recurrences. The sharing of such information also helps us take a renewed look at the Group′s safety standards. In fiscal 2018, we will conduct risk assessments based on the Group's uniform standards mainly at production and other sites in Japan that have introduced the internal framework. Although we see an increase in the number of non-serious workplace accidents, the rate of serious incidents is declining thanks to our putting into practice the process of identifying and analyzing incidents to prevent recurrences, attending to near-miss incidents, KYT (danger prediction training), risk assessment, etc.